Frequently in modern music, parts are not provided with performance materials, thus requiring the performers to construct their own parts. This is most often the case with composers that came of age in the Darmstadt scene of the 1960’s. I wish publishers like Universal Edition and Ricordi would go through their back catalogs and modernize some publications. There are some pieces for which I have the score but that I have not yet programmed because doing so would require having the music re-engraved. And there are some pieces that, barring an incredible performance fee, I would simply refuse to play again if asked because the performance materials are such a nightmare to deal with. I’ve unfortunately come to expect these nightmare scenarios with one of my favorite composers: Franco Donatoni. 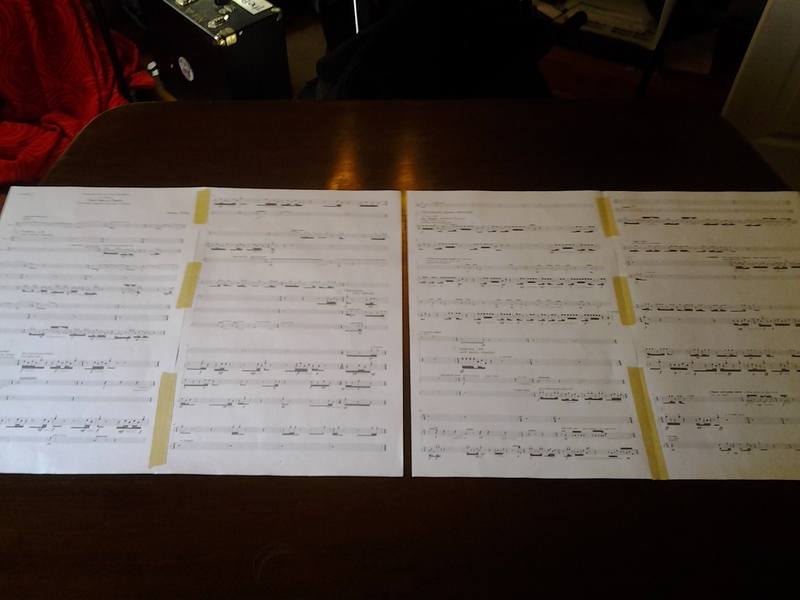 I’ve had the score for his Cinis II (for clarinet, marimba, and percussion) for years, but the music is written so large that each oversized page only has three measures of music. This page is 11×17. Three measures of music. Thanks, Ricordi. Since I am no wizard with Finale (i.e. I don’t know how to use Finale), I would have to pay someone to re-engrave the music in order to play this piece. Professional engraving would reduce the 35 page score to a part that is 10 pages or less and with workable page breaks. The piece is only 105 measures long, after all. 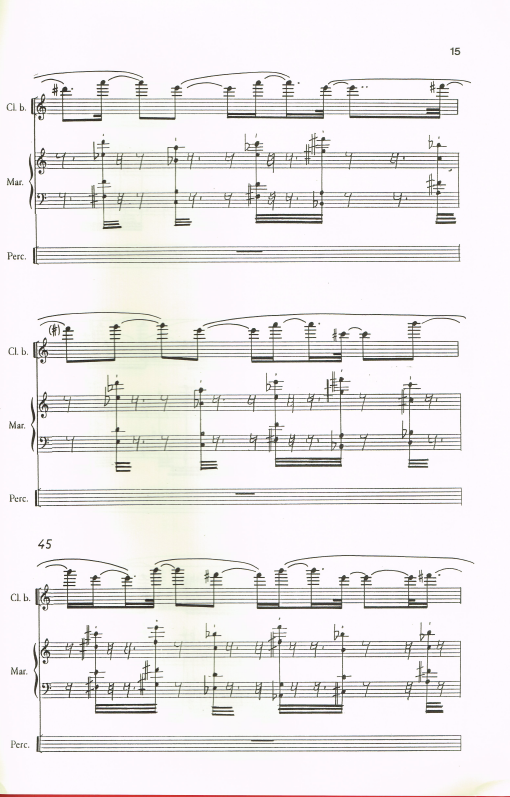 As bad as that is, the score for Cloches III for two pianos and two percussionists is even worse. The percussion set-ups are so large that both percussionists would need multiple copies of the music spread across several instrumental stations. However, the single score that each percussionist receives from the publisher is so large that it can not be photocopied. And again, the music is written so enormously that each performer has to make a page turn every 10 seconds. Needless to say, the page breaks are not in convenient locations. It would take a talented copyist a week to fix both of those scores and then Ricordi would actually be able to give out workable performance materials for one of the most respected composers in its roster instead of the oversized study scores they currently send out. In a perfect world, all sheet music would come off the shelf ready to use and performers wouldn’t have to fuss with it so much, but sadly that isn’t the case. It is not uncommon for me to spend more time making my own part for a piece than I do practicing it. 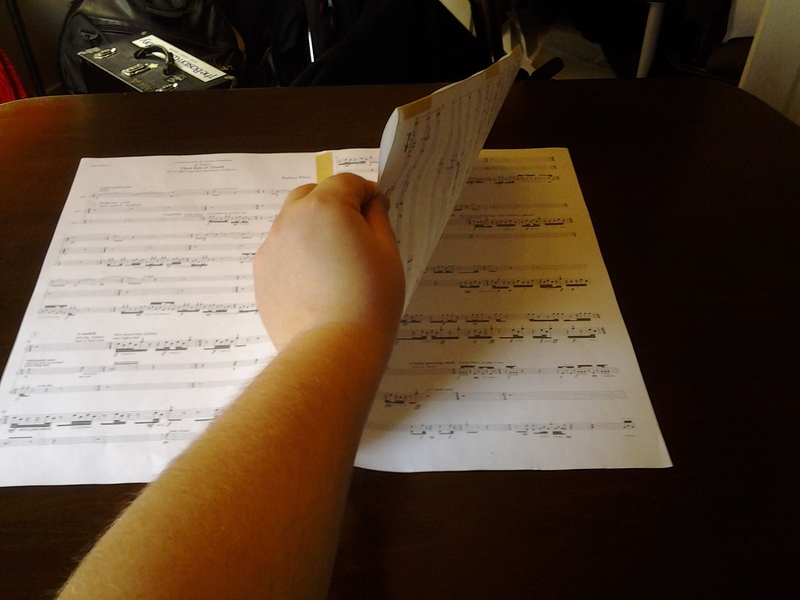 The two most frequent problems I have to solve are making a part from a score and binding a part from loose pages. I recently received the performance materials for Barbara White’s Third Rule of Thumb for percussion quartet, which I will perform at the upcoming Fromm Concerts at Harvard. It is an expertly prepared score. My part (player 2) is enlarged, while other parts are miniaturized in the staves below. Furthermore, only relevant parts are included in full, and other important events are indicated with text (see bar 232). My part consists of 15 loose, single sided 11×17 pages. 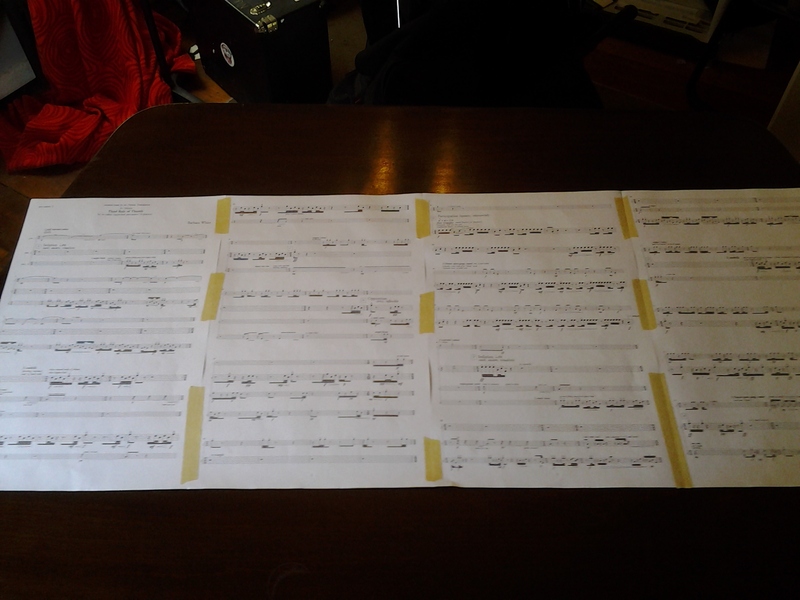 It won’t work well to just have all these loose pages sitting on a music stand during performance. That would increase the chances of the music falling off the stand, and it would make page turns needlessly awkward. 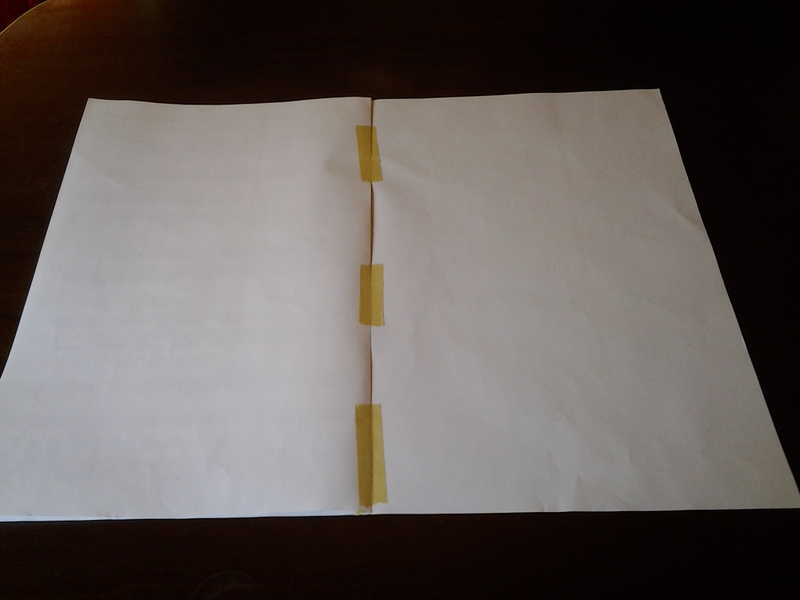 So, I’m going to bind the pages together with masking tape. It is a quick, easy, and low-tech way to deal with the issue. Repeat these steps until there are no more pages. From start to finish, binding all 15 pages together took 15 minutes or so, and now my page turns are all worked out for performance. In the next post, I’ll discuss my more recently developed high-tech method of part making. 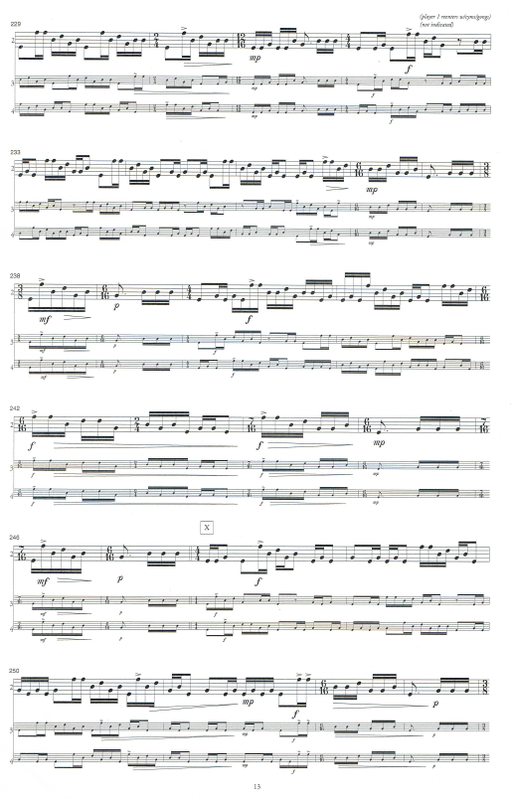 This entry was posted in Contemporary Music and tagged Casa Ricordi, Darmstadt, Franco Donatoni, Music, Percussion, Sheet music, Universal Edition on March 30, 2013 by tolleism.